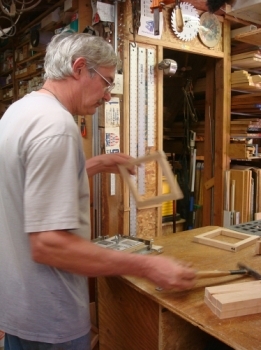 Here is Randy hard at work making your looms. We both spent the day in the shop. And the sun was shining outside! Oh well, there’ll be more sunshine. But we are taking a day off this coming week. Because… TaDa! it’s my birthday! Yes indeed, the infamous April 1st. And we are going north and having a Ritzy dinner with my sister and her husband and then spending the night in a Bed & Breakfast, a thing I have never done and wanted to try once, at least. One of these years I’m going to take a train ride… another one of those things on my Bucket List. 😀 It may be a boring list but we each have our own version, after all! Hope you have daffodils blooming. too! 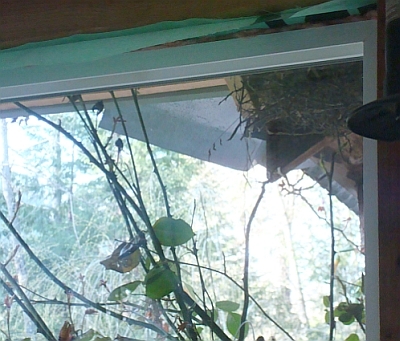 The Jays are back rebuilding the nest we had to remove temporarily when we changed the windows last summer. I wasn’t sure if they’d like the changes but they don’t seem to mind. Could not catch them in the act, they are working too hard and too quickly for my camera. Handwoven’s Not Just Socks contest loser. This is the sock yarn project that was a finalist but did not win. It is one of the dresses I wove for the Hand-Woven magazine sock yarn contest. It is Tofutsies sock yarn and the trim is crocheted with Wildfoote. I knitted a ribbing on the sleeves. This dress was woven on the 2”, 4”, & the 6” Multi square looms, weaving diagonal. I did two others from a different brand of yarn. The good news is that one of the winners did win using our Hazel Rose Looms. For me that is almost as good as winning myself! Congratulations Zann! Be sure to keep a look out for the magazine in your bookstore. Not sure when the winners will be published but it should not be long! 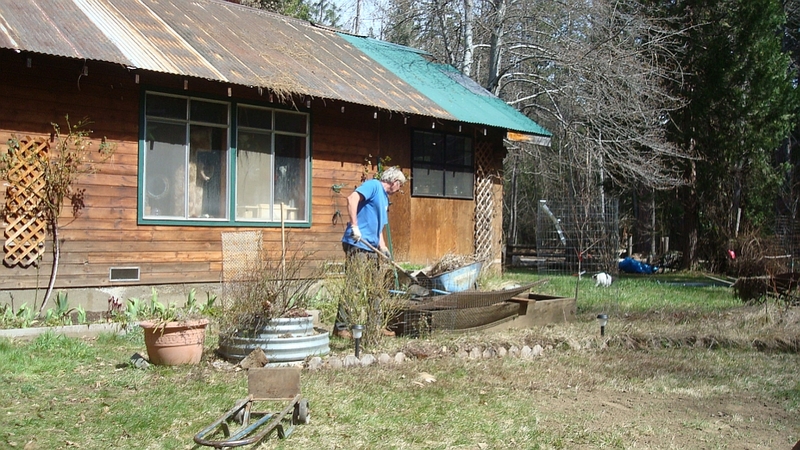 Here’s Randy sifting dirt and compost though a screen into the newly moved garden box. The other was moved last fall but I had more plants to find new homes for in this one. You can just see some red sprouts there by the foundation behind the iris. That’s the peonies I moved out of this box last fall. Even the tree peonies appear to have survived their untimely move. That rather surprised me. Not sure what will go into this box. The other one has budding rhubarb and my stevia plants go there too. I want some leeks and peppers, maybe an eggplant. I’m going to try the hanging tomato planters this time. I’m wondering… if they are hanging from the rafters if it will keep them out of the reach of marauding deer? Still trying to be spring. 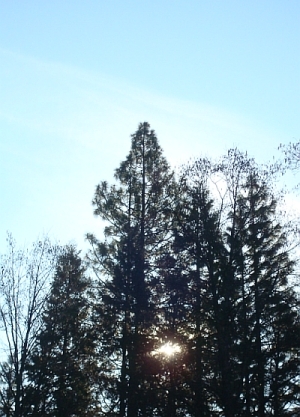 As you see, the snow is gone again. We’ll probably have more showers but for now its lovely, blue sky, and warm. Got up to 71 today. It’s back into the 30’s tonight, tho, so not quite spring yet. 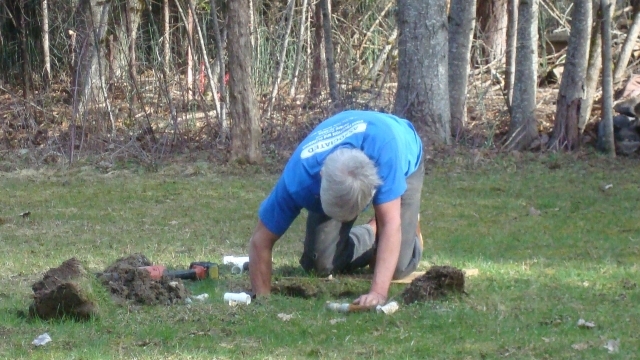 Here’s Randy out fixing the sprinkler he broke last fall by dropping a dead alder right on it! Good shot had he been aiming for it. but he’s good at plumbing, too and it’s all fixed for when that time comes again. Had to take my car into Weaver to the body shop to get the fender and tail light replaced from when that pine tree backed into me. We also picked up the nail order and some groceries. I have a bunch of looms to ship tomorrow but we took the day off. First time we’ve spent a day out of the loom shop in two weeks. We needed that, I did get a little done on my weaving project this evening but have not been getting much time to use them, too busy making them! 🙂 Hope you are enjoying yours, too. This little fellow is actually in Sis’ s yard but ours look pretty much the same this morning. We got between an inch and two of very light and fluffy snow. This morning the sun is out in a blue sky and the little breeze sets this stuff flying and falling all over again. Randy had to go fix broken plumbing… Temps in the 20’s again… but once the crisis is over he’ll be back in the loom shop with me. We brought home a load of lumber yesterday and looking forward to this snow melting (again! ;-)) a dozen bags of manure for the gardens. Hope you are getting some sunny and warm! 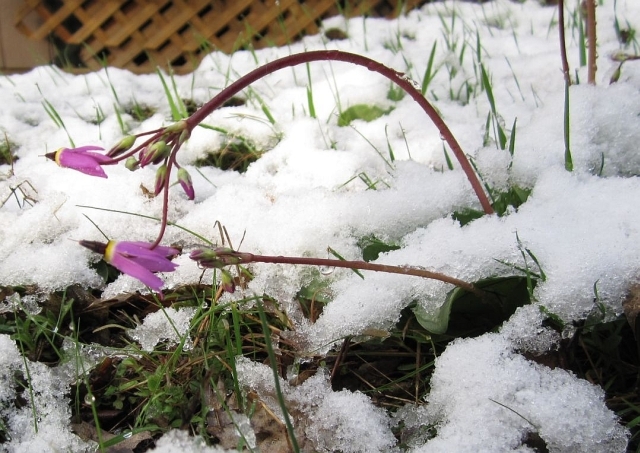 Meantime, I hope you are getting some spring! Our snow has melted again and the sun is shinning this morning. I know some of you have had way too much winter for one winter so I’m wishing you an equal warm sunny spring! We’re heading north tomorrow to pick up Randy’s new boots and re-stock the wood shop. This last couple of busy months have nearly depleted our stores. And he wants to visit with our Alaskan friend who is wintering this year in Oregon to discuss the trip up he wants to make.